Histoires sociales de l'art. 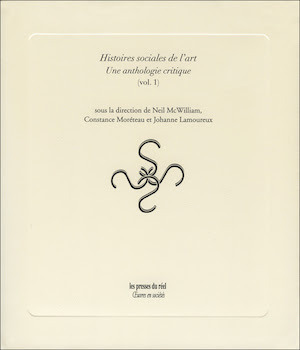 Une Anthologie critique, edited by Neil McWilliam, Walter H. Annenberg Professor of Art and Art History, together with Johanne Lamoureux (INHA, Paris) and (EBABX, Bordeaux), was recently published in France by Les Presses du réel. A two-volume historiographical survey of social art history in Europe and the United States from the 1930s to 2000, the anthology pairs more than thirty classic texts and lesser-known articles by art historians ranging from Max Raphael to Griselda Pollock with commentaries by leading contemporary scholars. These interpretative essays situate individual contributions both within the development of art history as a discipline and as integral elements in socio-political debate, particularly within the cultural politics of the left. The anthology breaks new ground in its presentation of a much more ideologically diverse genealogy of the social history of art and introduces texts and methodologies unfamiliar to a French audience (and often little known in the English-speaking world). It includes a substantial historical introduction by McWilliam, together with an essay on the work of the art historian Robert Herbert by Mark Antliff, Mary Grace Wilson Professor of Art and Art History at Duke.